Dr. Dry named "Best Cosmetic Surgeon"
Article: "The Best of 425"
We are pleased to announce that Dr. Dry has won for Best Plastic Surgeon in KING 5 TV's Best of Western Washington 2008 poll. WXOW 19 La Crosse News Article / November 7, 2008: Bye bye bat wings. "If you're a woman 30 to 50, chances are you know what bat wings are, drooping skin that hangs under your arms. Weight fluctuation, aging and heredity can all contribute to the problem, but now there's a fix." "Dr. Dry says, "if the skin is loose and it's lost its tone, its elasticity, all of the diet and exercise in the world is not going to tighten up that skin, unfortunately." Read the full Article (opens the WXOW website). Dr. Dry makes the List. 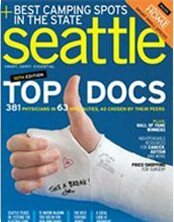 In Seattle Metropolitan magazine, August 2008 issue, Dr. Dry is listed as one of the top Cosmetic Plastic Surgeons in the article Top Doctors 2008. His name is listed on p.96. 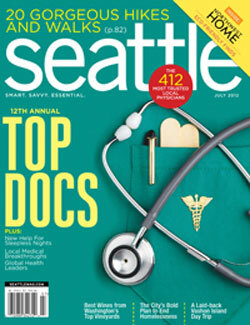 Dr. Dry is honored to be among the 11 plastic surgeons selected for Seattle Magazine's Top Doctors feature for 2012. There were 18,000 nominations for doctors in different specialties. The selected physicians were chosen by their peers as among the very best in their fields. "These are the doctors other doctors turn to when they or their families need care." Vote Dr. Gavin Dry Best Plastic Surgeon for this years KING 5 Best of Western Washington Contest! KING 5 Best of Western Washington's contest is in full swing. Vote for Dr. Dry as the Best Plastic Surgeon today! Voting ends on October 9th, click here to vote. Dr. Dry Voted One of Seattle's Top Plastic Surgeons in the KING 5 Best of Western Washington Contest! Dr. Gavin Dry has been named one of Seattle's Best Favorite Plastic Surgeons in the KING 5 Best of Western Washington contest. Patients from Kirkland, Bellevue, and the greater Seattle area voted to award Dr. Dry with this unique distinction. 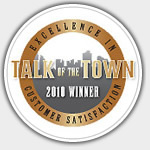 Read the many reviews and comments on Dr. Dry's Best of Western Washington page. 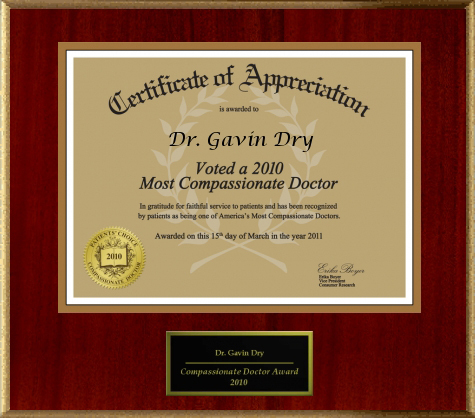 Dr. Gavin Dry was selected as one of America's Top Doctors for 2010 by Castle Connolly. Castle Connolly Medical Ltd. publishes an annual guidebook titled Top Doctors which lists those whom Castle Connolly has determined to be in the top 10 percent of the region's physicians. We've added 3D animations to our website as a tool to present complex conditions and procedures in an easy- to-understand format. Visit the Plastic Surgery 3D Animations page. Our office looks forward to continuing to provide outstanding care to all of our patients in 2010 and beyond! Read about this award on our media page. Our Patient goes on the Dr. Oz Show to share her story. Dr Dry has been chosen by the FDA as one of the 50 surgeons in the country to use the new Cohesive implants. We are proud to announce that Dr Dry has been chosen as one of the 50 surgeons in the country that has been approved by the FDA to use the new Inamed 410 Cohesive (“Gummy Bear”) implants. All silicone implants can be called “cohesive” but the 410 implants differ from regular silicone by the fact they retain their shape (shell does not fold), they are teardrop shaped and they cannot leak. We are very pleased that we can offer the latest in Implant technology and safety to our patients. Call the office to see if you meet the requirements for Cohesive implants. There is a “Cosmetic Surgery after massive weight loss surgery” support group on the first Tuesday of every month at the Evergreen Education Center, located at 12333 NE 120th Lane, Kirkland 98034, from 6 pm to 8 pm. Surgeons and nutritionists will answer questions and discuss a variety of topics including but not limited to: coping with your new life in your new body, fitness, aesthetician (learning about skin care).